I saw this article and recipe in last week’s Taste section of our local newspaper and that was all the inspiration I needed. The headline was “One more taste of summer” and I said yes, please. Tomatoes and corn are still plentiful here in Minnesota and I have not yet had my fill of either. 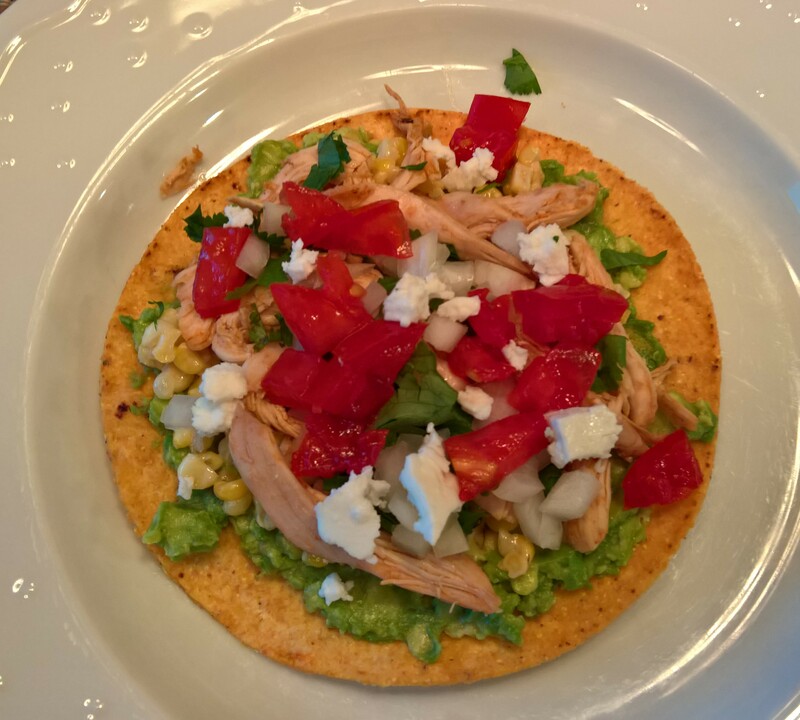 If you know us here at S&SK you will already expect that I made a few adaptations to the recipe, but I think following the original, using my recipe or making up your own riff would all end in a great tasting tostada. We both loved these, and as Randy said “this has great mouth appeal”. Indeed! This note is from the original article: Elote, or roasted corn on the cob, is a popular street food in Mexico, and is often served with condiments such as Cotija cheese, lime juice, mayonnaise and ground chile peppers. This recipe makes approximately 8 tostadas. Once the chicken is shredded, heat 2 tablespoons oil in a skillet on medium high. Add 2 minced cloves of garlic. Saute for a minute stirring constantly. Add the chicken, saute for another minute or two, then add 1-2 tablespoons adobo sauce from a can of chipotle chiles. Cook for another couple of minutes until heated through all chicken is coated with the sauce. Stir in a squeeze of lime and some salt, to taste. Set aside. The chicken can be served warm or room temperature. For the corn: You’ll want about 2 cups of corn. I got that amount from 4 large ears of sweet corn. Shuck the corn and then slice the kernels off the cobs. Heat 2 tablespoons vegetable oil in a skillet on medium high heat. Once hot, add the corn kernels and 1/2 teaspoon dried oregano (or to taste). Saute, stirring often until some of the kernels start to brown. Remove from heat, turn into a bowl and set aside to cool. Once cool, add 1-2 teaspoons mayonnaise, a squeeze of lime and some salt, all to taste. For the avocado: Mash 2 ripe avocados to the consistency of a chunky paste. Add a squeeze of lime and some salt, to taste. Chop 1/2 yellow or white onion. Seed and chop one ripe red tomato. Chop 1/2-1 cup cilantro leaves. These can be kept in separate bowls or combined for a quick pico de gallo. Crumble some feta cheese or have on hand grated Cotijo cheese, optional. Spread some avocado on the tostada. Add a layer of the corn, then some chicken. Top with the onion, tomato, cilantro and cheese if using. If you love lime, squeeze a little on top. Dig in!! The next night we made vegetarian tostadas, starting with a layer of refried beans, then adding the corn on top. Instead of mashing the avocado, we chopped it and added it on top with the onion, tomato, cilantro and cheese. Rave reviews for this approach too! 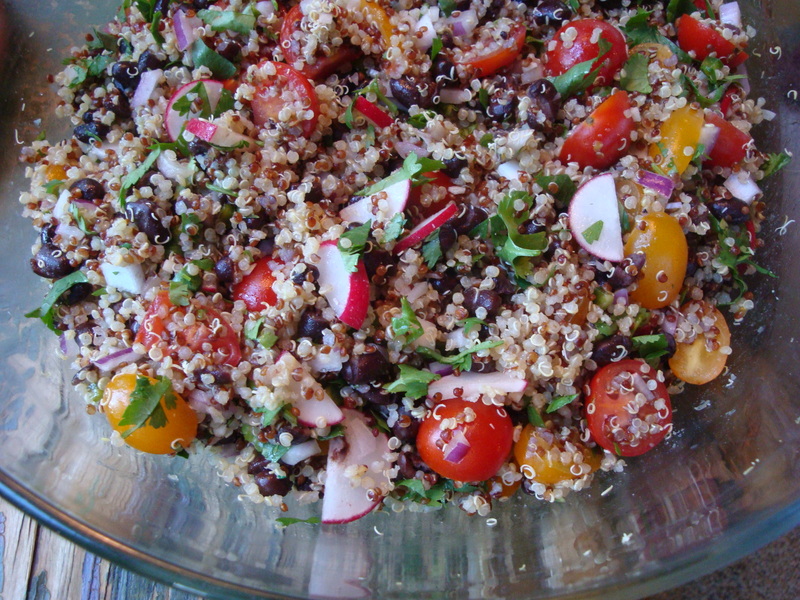 Summer Quinoa Salads – the saga continues! I’ve become a sucker for quinoa summer salads – you will find several of them here on Sweet & Savory Kitchens! I’m always on the lookout for new and different quinoa recipes, so I immediately took note of this recently posted recipe from a fellow Minnesota food blogger on her Eating for England blog. This is my riff on her recipe which embodies the flavors and ingredients of many Mexican dishes. Enjoy as a main dish or a side for a summer grilling menu. Beverages? Iced tea, a lager beer or a dry rose wine all blend beautifully! Rinse the quinoa in a sieve and drain. Place in a saucepan, add the water and bring to a boil. Turn heat down, cover and simmer for 15 minutes or until water is completely absorbed. Uncover and let sit for 10 minutes. Fluff and put in a bowl. 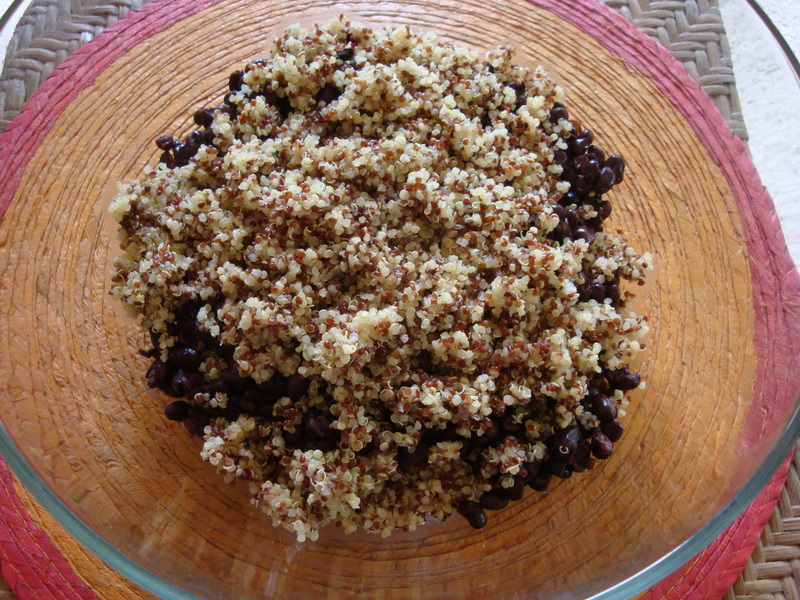 Add the black beans to the quinoa while it’s still warm. Set aside to cool to room temperature. When cooled, add the prepared onion, garlic, radishes, jalapeno pepper and tomatoes and stir to blend thoroughly. Add the Lime Dressing and stir to combine. Gently fold in the cilantro or parsley. If the entire recipe will be eaten on the day it’s made, add the avocado along with the cilantro. Otherwise, pass the avocado for people to add to their individual servings. Combine all ingredients and whisk until slightly emulsified. A NOTE ON THE CUMIN: Instead of ground cumin, next time I make this I will toast 1 teaspoon whole cumin seeds and then coarsely grind with a mortar and pestle for enhanced cumin flavor. I’ll report back.